Amusement park safety is paramount to the experience of visitors. One little amusement park accident can ruin the entire day or more. Sound View Electronics automated messaging system can help. Our systems are used by the NYC subway system and the World Trade Center in order to help prevent accidents. The best way to increase theme park safety is to avoid mishaps entirely and that is what our system can help you do. Imagine a family of 5 leaving the park after a long day. The three children are happy but exhausted. The older two are just talking away about how much fun they had. The youngest girl sits down on the escalator with her long hair dangerously close to the stairs. Shortly after getting on the escalator, the mother hears the announcement “Please do not sit on the escalator.” She reaches down and takes her daughter’s hand, pulling her up to stand. A theme park accident is avoided. The family is happy and a potential disaster is avoided. 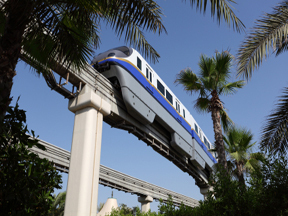 The passengers get home safely and the theme park avoids possible litigation and insurance increases…. all because of an automated messaging system. Our system was first introduced on the escalators of the New York City subway system to help prevent accidents. The New York City subway system is one of the most challenging environments to employ an automated messaging system. They needed to deliver crisp, clear, and easy to understand messages in a cavernous subway. 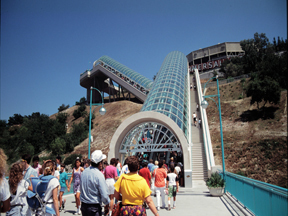 The amplification system needed to be located in the pit of the escalators which required them to be vibration, dust, dirt and water resistant. The speakers had to blend with the escalators but also be vandal resistant. Finally, they needed a system that would not lose the automated messages if the power was interrupted. Out of the challenge of the New York City subways came the toughest, most advanced, attractive, automated messaging system for escalators and walkways on the market. Contact us to discuss how we can enhance your theme park safety program. Our messaging systems can also help you to direct and/or instruct your visitors. Consider the morning crowd ready to enter your park. You may want to direct visitors who have already purchased tickets to enter on the left and those who need to purchase tickets to go to the right after exiting the walkway. An automated message while they are riding the walkway can do this and help you to keep the flow of people moving quickly and safely. The options for directions or instruction are as vast as your needs. You can also do advertising with our announcement system. For example, an automated message can be played on the escalator or walkway as they exit to influence visitors to eat dinner at a restaurant affiliated with your theme park…. show today’s ticket for a free dessert item or a free beverage. Ask us about our turnkey advertising system; we do all of the work and you sit back, share the profits and turn your walkways and escalators into profit centers. Sound View amplification systems can drive 6, 8 and 12 or more speakers to fit your specific needs. Our speakers come in seven different configurations and we make the enclosures in stainless steel or brass. Our glass panel attached speakers blend in well with your glass escalators or walkways and provide excellent sound quality. You can have one or two message sequences play on your escalators and walkways and they can play in any language needed, improving moving walkway and escalator safety for all customers. We can change the message via a USB flash drive, SD card or via the Internet. Do you have an idea for an automated messaging system for something other than an escalator or walkway? By all means contact us. One of our core skill sets is problem solving. We will be more than happy to discuss your unique needs and work with your team to develop the best solution for your situation.